There is no wrong time to have a baby! Whether you’re in your 20s or 30s there are going to be a number of benefits and challenges that lie ahead. Regardless, all roads lead to your very own tiny bundle–no matter how or when you get there. I have been pregnant in my 20’s, and now having entered my 30’s in my third pregnancy, I can say there are several notable differences that I’ve discovered. Today, I’m sharing those changes with you! You’re as low risk as you will ever be for having a cesarean, giving birth to a baby with down syndrome, for developing gestational diabetes, or even preeclampsia. Despite being low risk, this might be your first pregnancy and you are paranoid about all of the things. You’re consulting “Dr. Google” and worrying yourself only to be told by your care provider that everything is just fine. Whoops! You have ALL of the energy! No coffee, no problem. You’re happy to take your care provider’s suggestion to cut caffeine because you’re naturally energetic. You will “bounce back” more quickly. As we age and undergo hormonal changes as women, it becomes more challenging to lose weight post pregnancy. It will never be as easy to get back into shape than it is right now. You got pregnant fairly easily! It’s likely that in your 20’s you required very little intervention to conceive (not always the case, of course). It’s less likely that you will have to undergo IVF or fertility treatments when trying to conceive in your 20’s. All of the attention is on you. It’s probably your first baby and everyone is so excited! Your cravings are catered to, your feet are rubbed, and you’re showered with gifts and celebrations. It’s so much fun and such a memorable time! Your marriage is still new(ish) and you might be worried about making such a big life change. You’re ready to take the next step and welcome a baby, but you do wonder if that means the honeymoon stage is officially over. Don’t fret mama, this is completely normal and the good news is? The best is yet to come! Your career is still in it’s infancy. You just landed your job a year or so ago and now that you’re expecting you might be trying to figure out how to tell your boss and what the news means for your career. Don’t forget, pregnant and nursing mothers have rights. If you feel like the news of your pregnancy is affecting your treatment in the workplace, see how you’re protected here. You are by no means “old” but if you’re 35+ you are considered of “advanced maternal age” and are made aware of all the associated risks including a higher likelihood of a c-section. 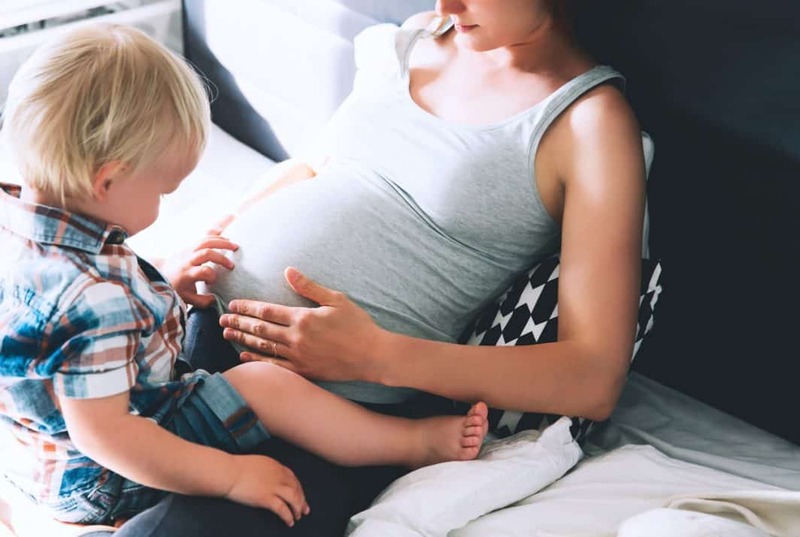 Fortunately, this might not be your first pregnancy and you are able to listen to your body’s cues and are acutely aware when something’s up. Morning sickness and fatigue hit you much harder. Perhaps you have other children in your care, or you’re in a higher position at work that requires more responsibility and stress. All of that is compounded by the fact that you feel like absolute garbage. There is more to juggle than just managing your pregnancy symptoms, and that can be tough. Luckily, you’re a seasoned super mom and have totally got this! Getting back into shape might be more challenging, but you’re sneaking in unintentional works outs all the time! You are constantly on the go, running after your other kids or making moves at the office. Those pregnancy pounds start falling off even if you have fewer hours to commit to the gym than you used to. The road to conception may have been more challenging. The need for fertility treatments and IVF are more common for mom’s over 30. If it’s your second or third baby, there is plenty of excitement, but the attention isn’t solely focused on you like it was for your first. Instead, you’re watching your little ones becoming big siblings and that brings tremendous joy of it’s own. Your relationship is rock solid! You’ve been married for a few years and the foundation of your relationship is rooted in memories and adventures between you two. Adding a baby to your family is a welcomed transition from partners to parents! You are so ready! Your career is also in a sweet spot! You and your partner have been in the workforce for awhile and have established savings and a reputation of professionalism in the workplace. Your employer isn’t worried about any dips in performance as you transition into parenthood because they know exactly what they can expect from you. Your finances are more stable and you don’t stress the small stuff. What were your experiences of being pregnant in your 20s and 30s? Did you notice any differences?